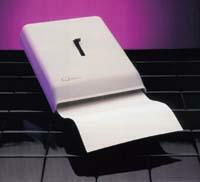 Qtowels are the latest concept in paper hand towels and hand towel dispensing. Qtowels are dispensed flat, one at a time with just the touch of a finger - no more tearing, tugging, cranking or unfolding. Extra large, super absorbent and very economical, one Qtowel has the soak-up power to thoroughly dry both hands. Does any clean-up job better.